Happy Monday! I hope you had a super lovely and relaxing weekend. 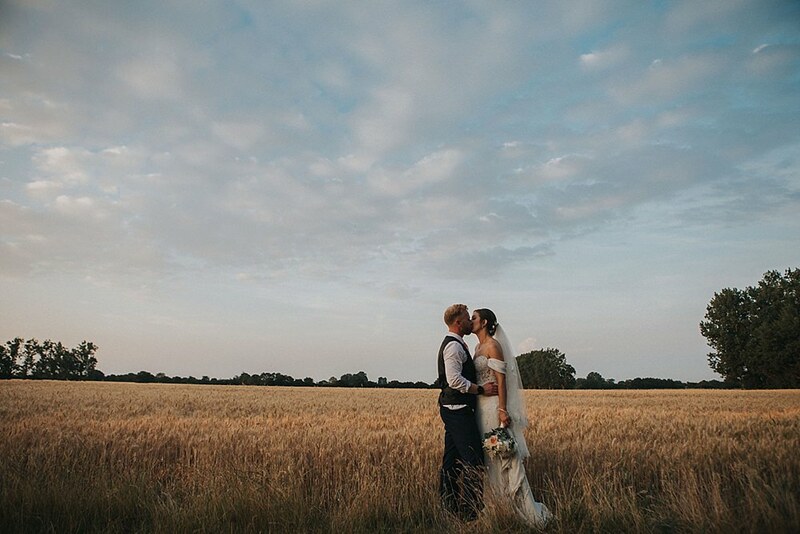 If you are feeling the Monday blues today, let them wash away with today’s beautiful summer real wedding feature. It has all the nostalgia from the heat wave last year and of course the World Cup. 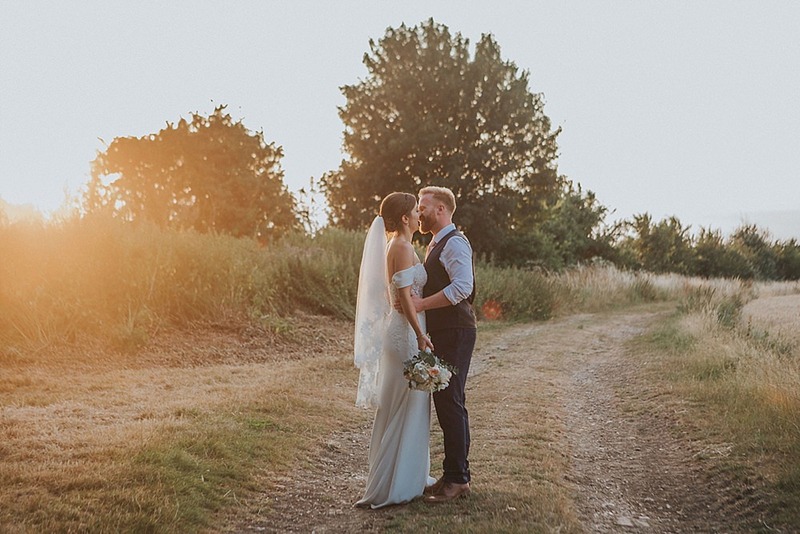 Let me introduce you to WWW readers Hannah and Kieran, who tied the knot on the 7th July 2018 at Houchins in Essex. 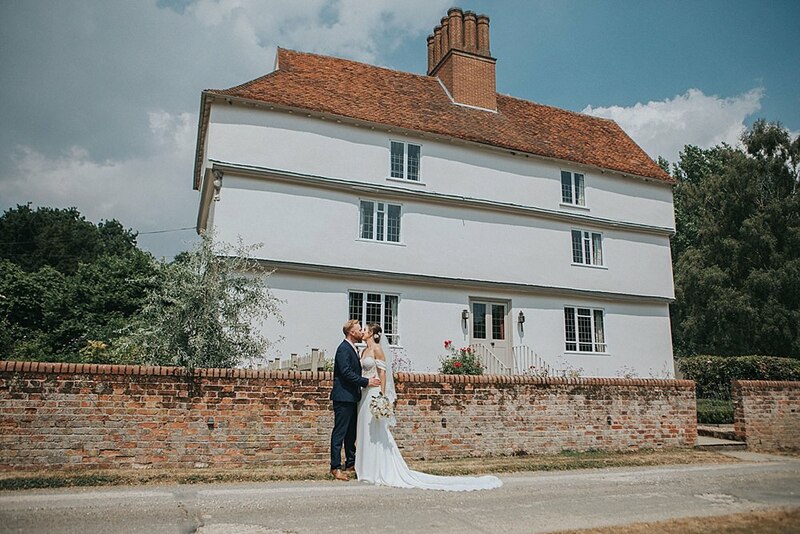 The venue compromises of a beautiful farmhouse, barns and glorious gardens which were perfect for their relaxed and informal wedding vision. 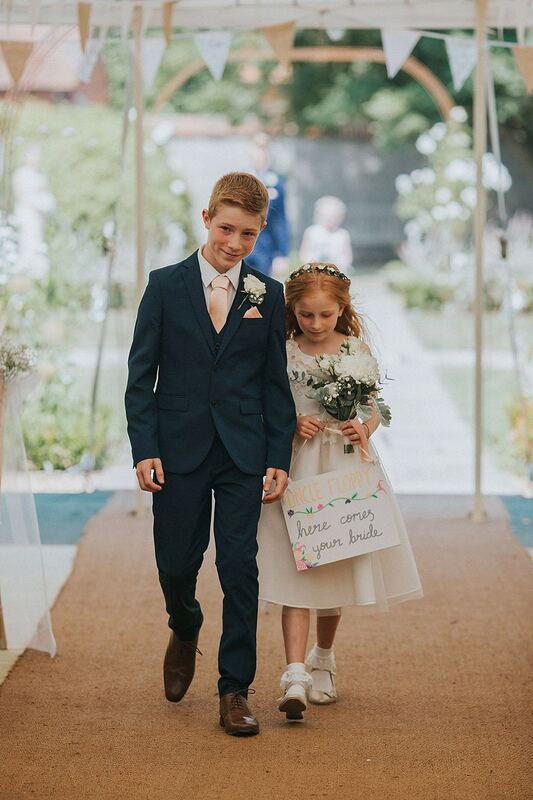 Their day was all about the fun too, with games outdoors, ice cream after the ceremony, glitter make up and a live band in the evening. Sounds wonderful on a hot summers day too. 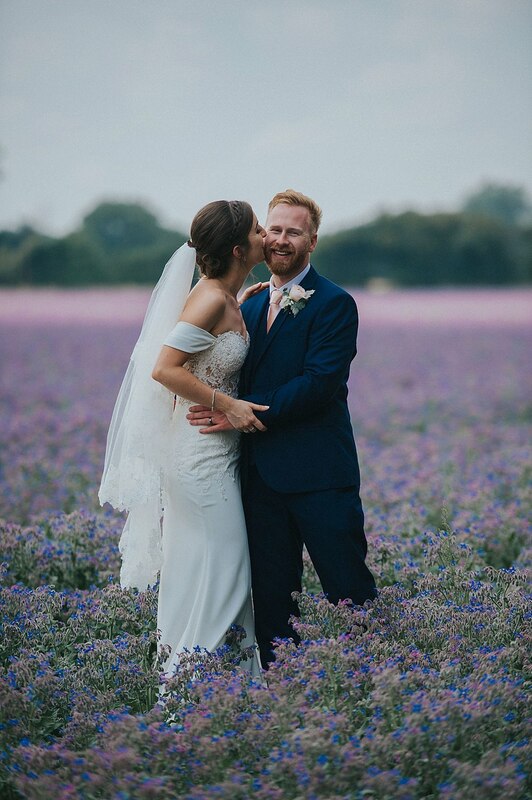 The images here by Julia & You are so breathtaking, especially the portraits of the newly-weds in the Lilac Borage field, so dreamy! Thanks so much Julia for sharing them with us. 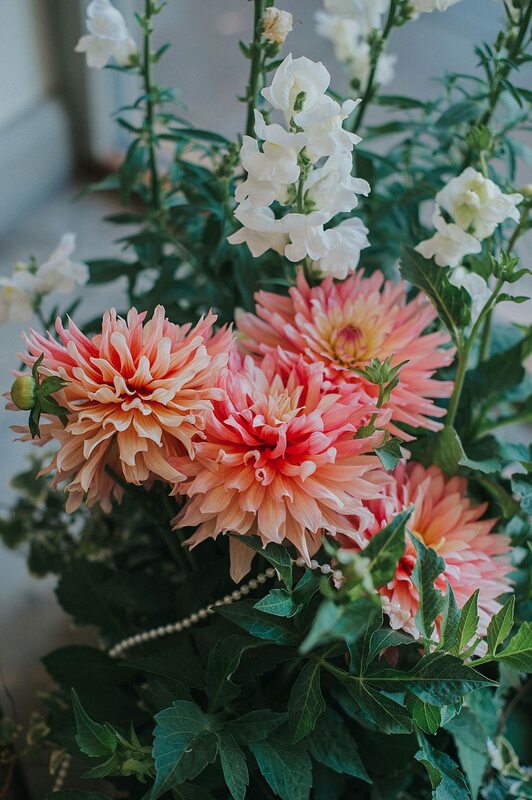 I really adore the peachy florals, which were oh so pretty and the hand picked flowers dotted around the venue too. 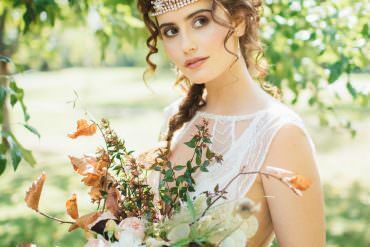 Keep your eyes peeled for stylish attire and floral signage all round. Kieran really pulled it out of the bag for the proposal. We had a summer bank holiday BBQ at our house planned with all our family and friends. Little did I know that it was in fact my surprise engagement party! 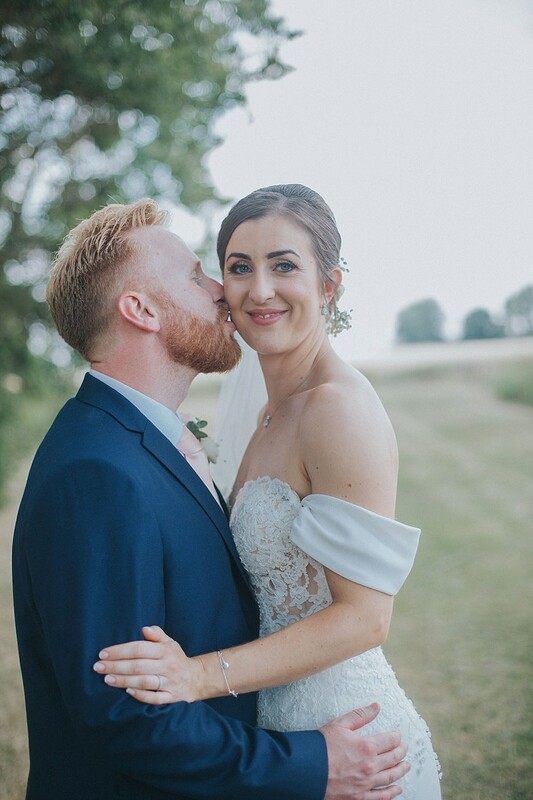 Kieran had created a film about our relationship and why he loved me, projected the film on the side of the house for everyone to watch, did a beautiful speech, got down on one knee and proposed, had a two-tiered cake and champagne waiting for everyone to celebrate, followed by fireworks. I was blown away. 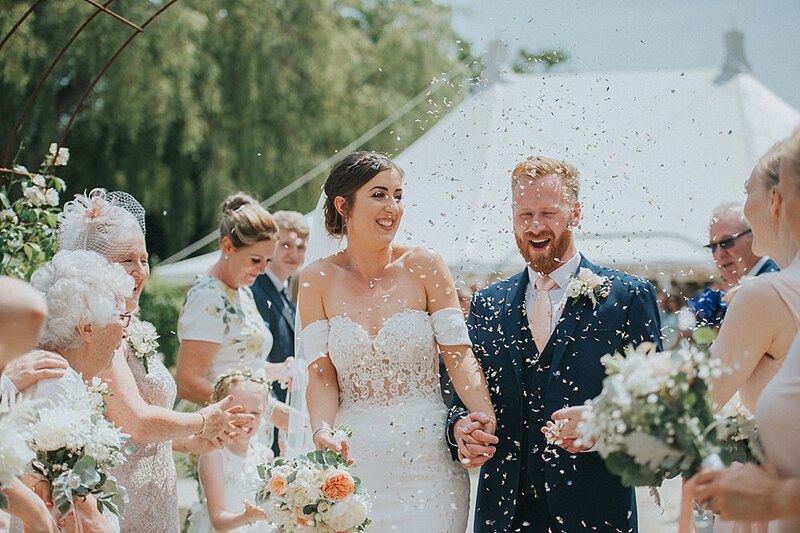 The wedding had a lot to live up to! 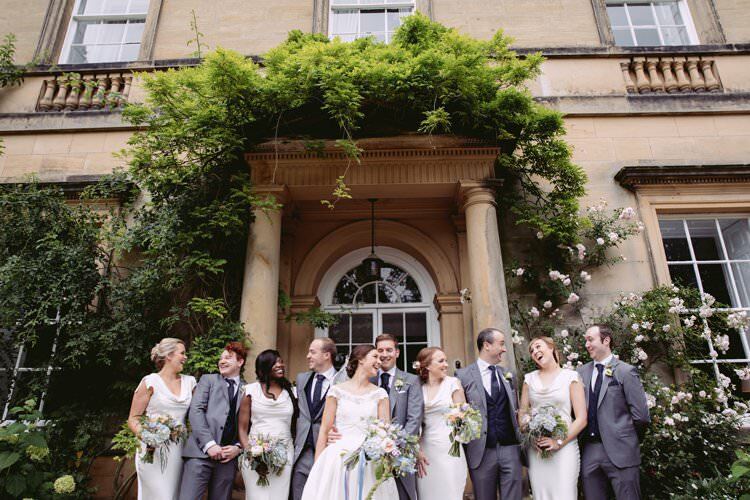 We wanted a relaxed and informal day where we could celebrate our love with the people that mean the most to us. Our friends and family live all over the country and we couldn’t wait to get everyone together in one place to celebrate with us. 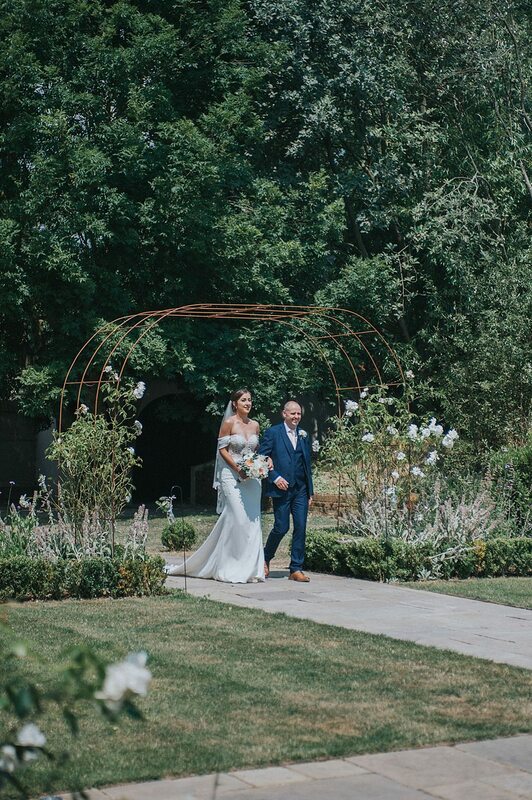 We were hoping for an outdoors ceremony followed by lots of food, drink and fun in the beautiful gardens, and were really lucky that the weather allowed for this. 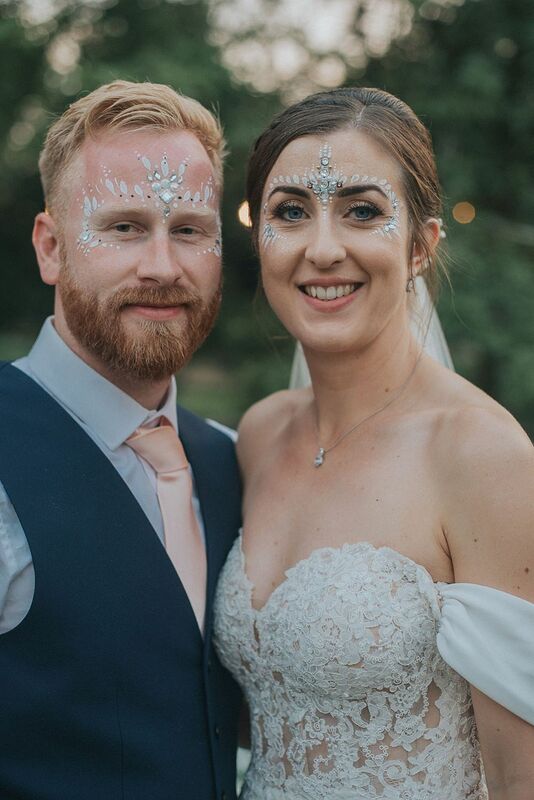 We wanted to organise our perfect party with lots of individual touches that represented us as a couple. I love planning so was in my element. I really enjoyed being creative and organising everything. 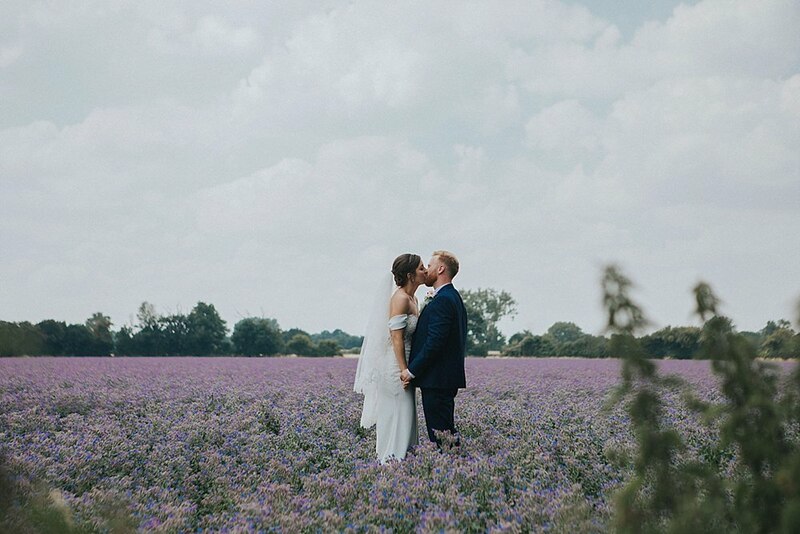 We only had 10 months between getting engaged and the wedding, so we had to be quite decisive from the outset. My poor mum had to listen to me brainstorm thousands of ideas, and always seem to nod in the right places. Kieran was much more involved than I thought he would be, which I was really happy about! Kieran created a budget spreadsheet so we could keep track of the costs and when things needed to be paid by, which was really useful as there seem to be so many payments being made to lots of different suppliers at the same time. 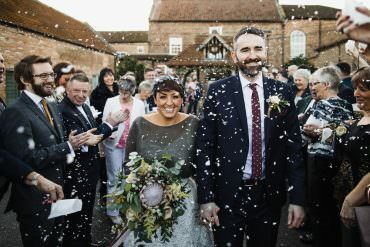 Houchins Farm is a grade II listed farmhouse containing accommodation space, along with a large modern barn for our wedding breakfast and evening party to take place. 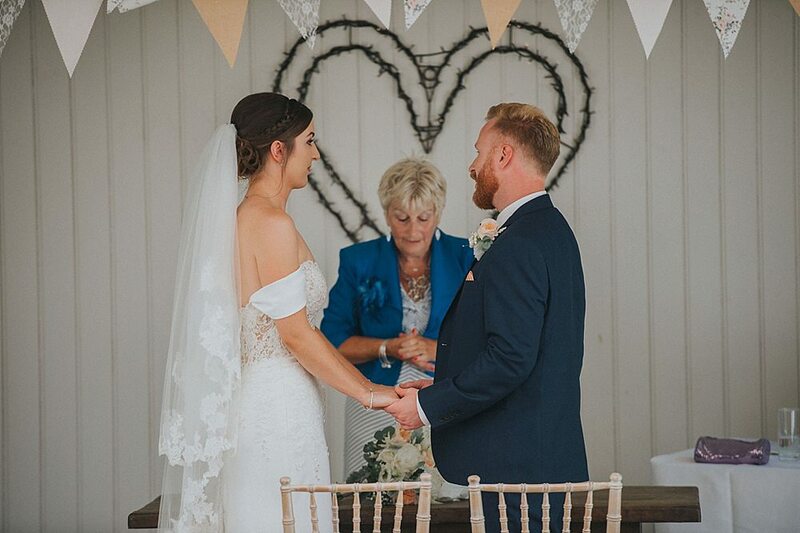 We were married outside under a large white open-sided marquee, which was perfect for the weather as it was 30 degrees so we needed the shade! 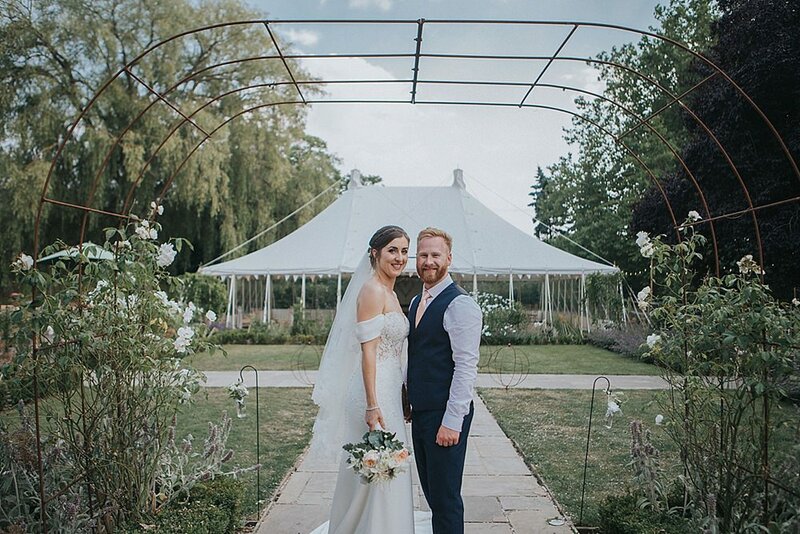 The venue has a beautiful terrace where our guests enjoyed drinks in the sun, and the gardens are perfect for an informal reception and garden games. It was so lovely watching our guests lounge on the grass with a glass of fizz and just enjoy the day with us. 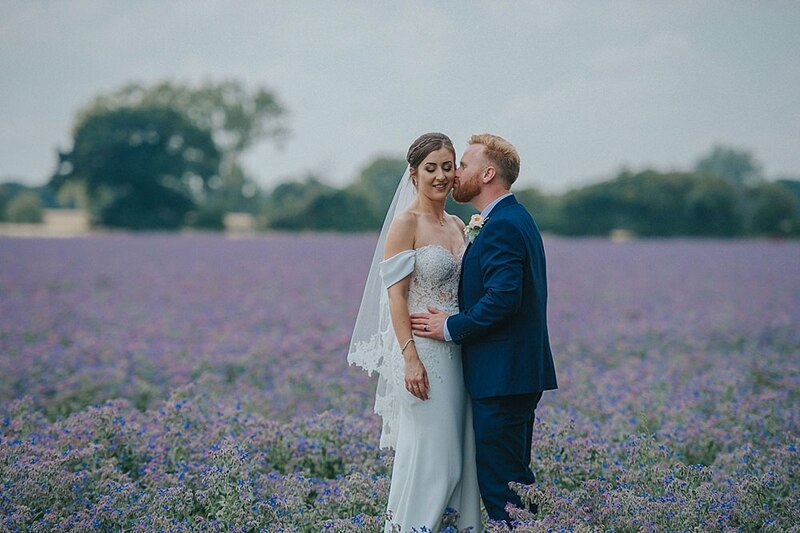 The venue is surrounded by beautiful fields where we had lots of wedding photographs, and we were so lucky that we seemed to time it just right with a field full of lilac borage, which are some of my favourite couple wedding photographs from the day. 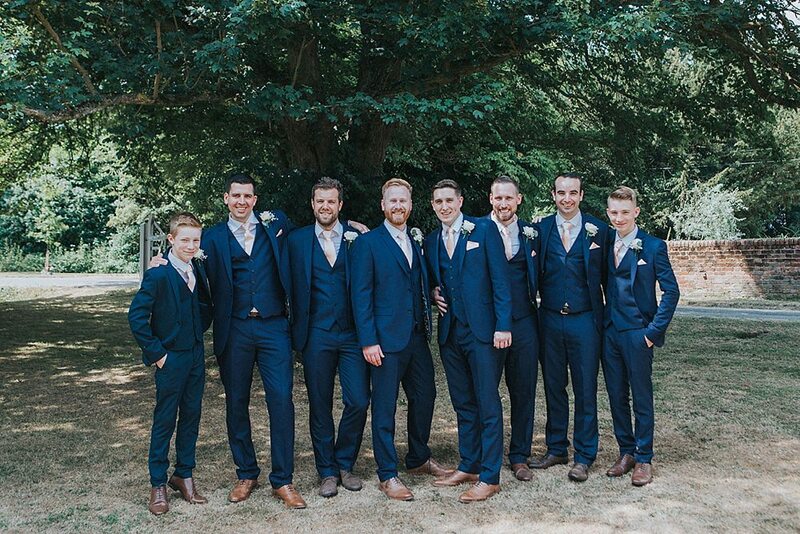 Kieran had 5 ushers (his friends from university), 2 page boys (his nephews), and our dads – and he wanted everyone in the same outfit. 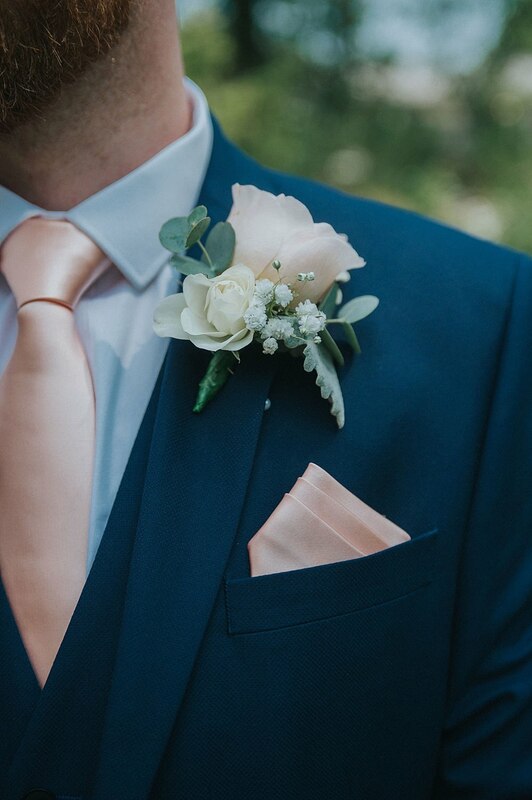 We therefore all got their blue three piece suits from Next, and their satin light peach ties and matching pocket squares from TiesRUs. Kieran and I spent an entire evening before the wedding researching and creating clever folds for pocket squares, and in the end we pre-folded them, ironed them down and stuck them in place with celotape! 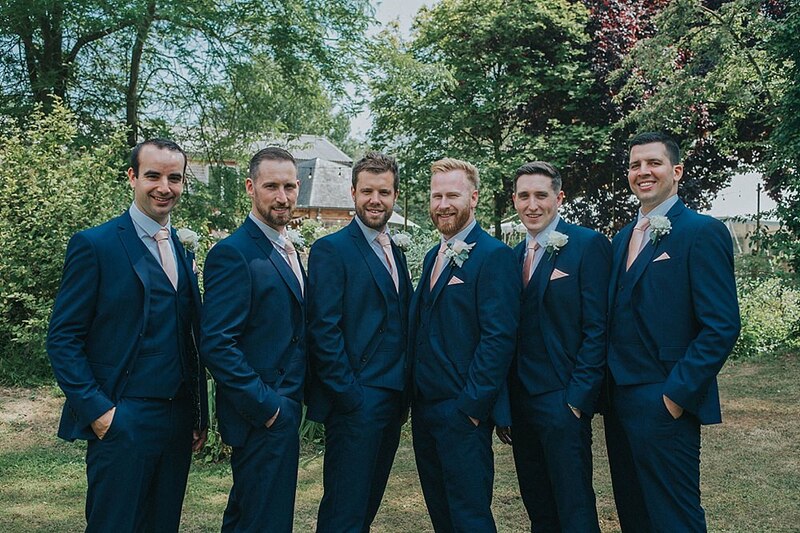 The boys all looked so smart all together, and the outfits were really finished off by the buttonholes from the florist. My hair and make up were both done by the very talented Lindsay Clough, who made me feel like a million dollars. I wanted a plait in my hair and it all off my face as it was so hot on the day. I was convinced my make up wouldn’t last due to the warm weather, but it looked as fresh in the evening as it had all day. 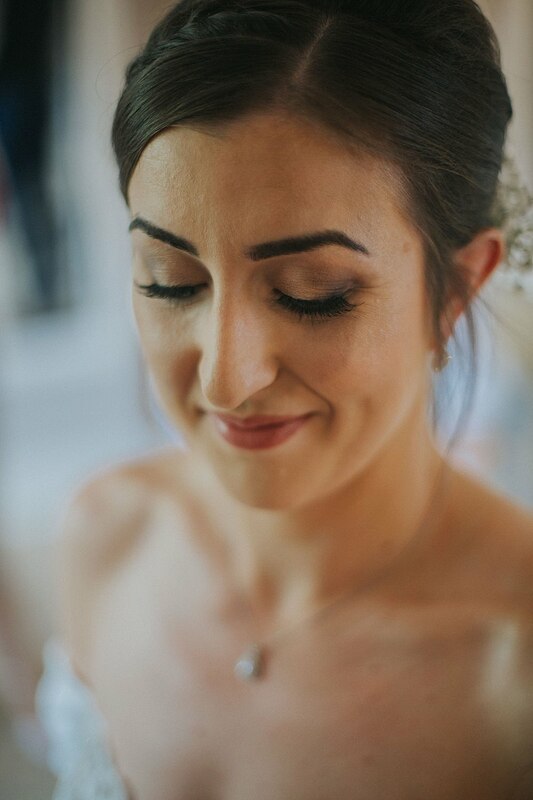 I had one trial before the wedding, and wanted it to look fresh and natural (still like me, but on a very good day!). 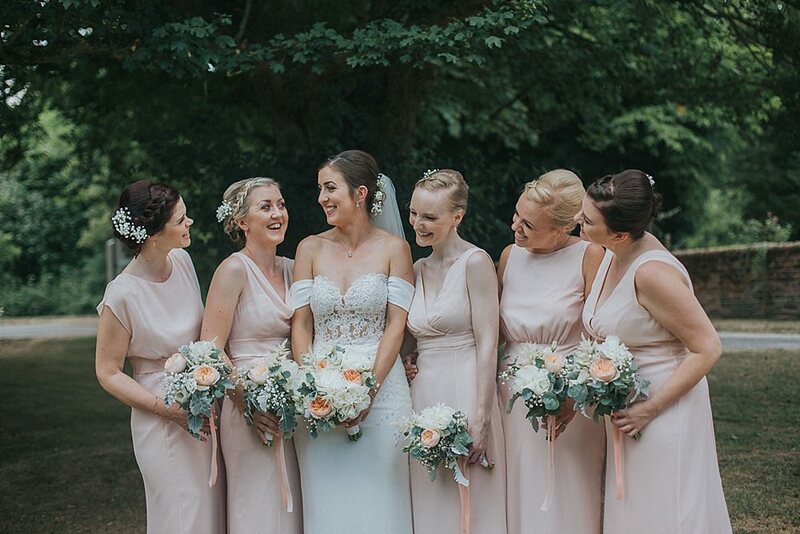 The bridesmaids also had their hair up with a plait on one side. Their hair was done by Kim Yates, and looked great. 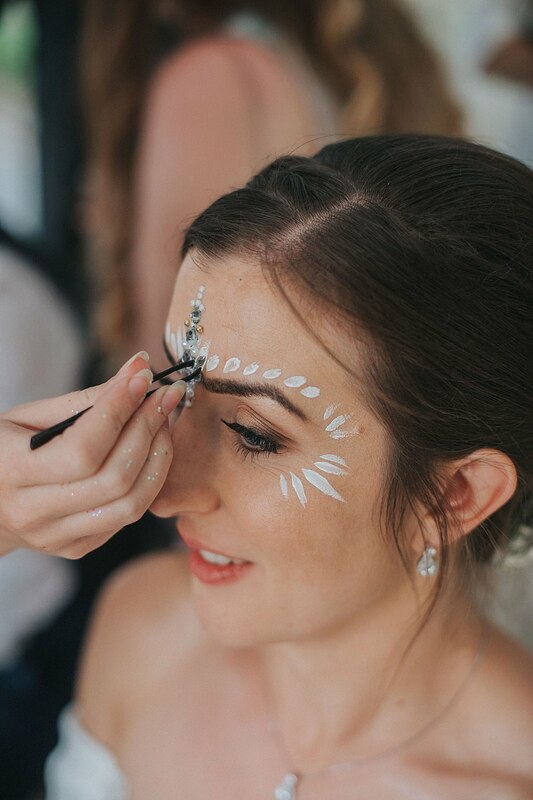 For the bridesmaids’ make-up we wanted someone soft and natural, which was done by Rachel Nightingill. 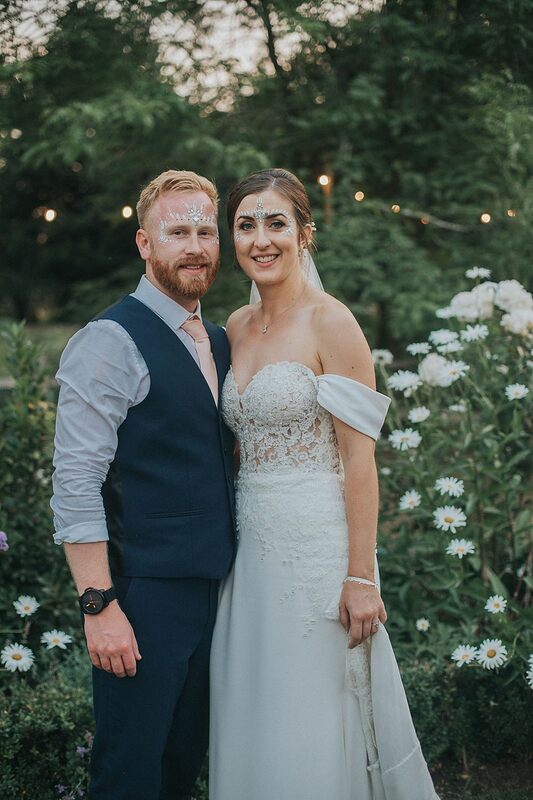 Again, their hair and make-up didn’t budge all day despite the heat and we all loved being pampered on the wedding morning. 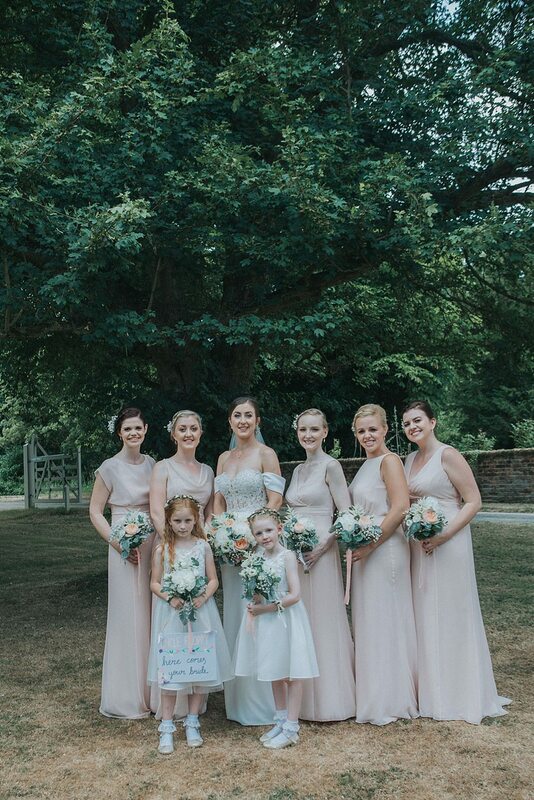 I had my sister and four university friends as my bridesmaids. 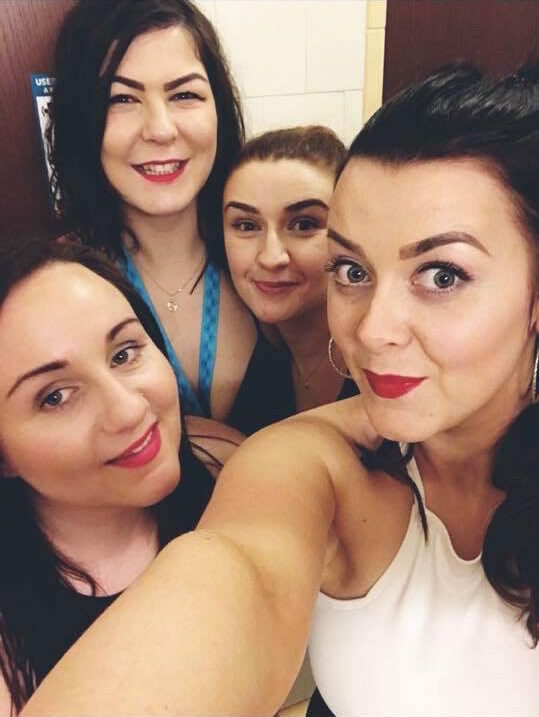 I am so glad I had them by my side, and they all looked stunning. They wore different style dresses from Maids to Measure, but all in the same light peach colour and same fabric. I loved that they all looked slightly different but still matched. 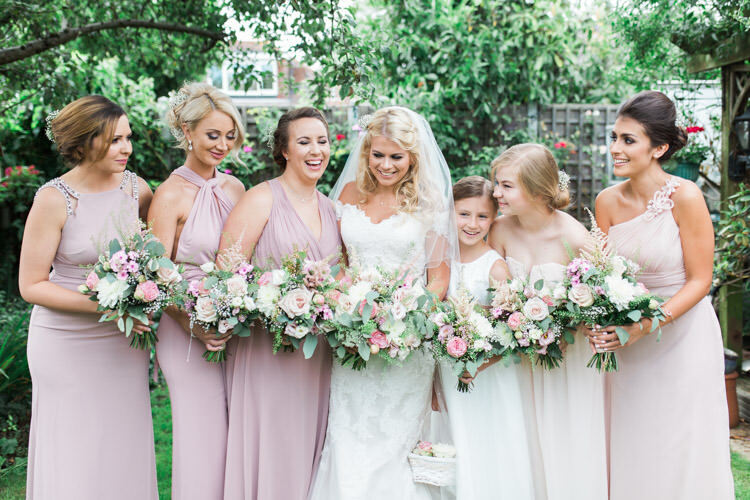 Their floral bouquets matched their dresses perfectly, and gave a really soft and pretty image. 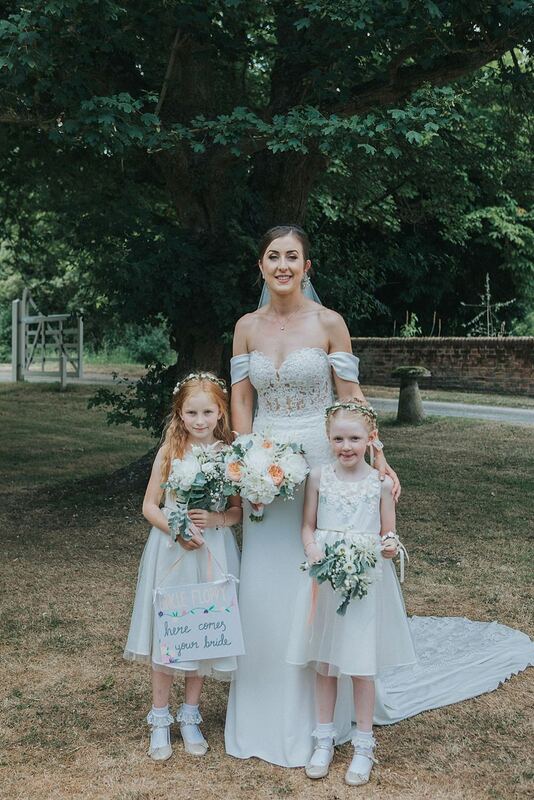 I also had two flowergirls, our goddaughter and our niece, who wore beautiful dresses from Monsoon with matching gold shoes. 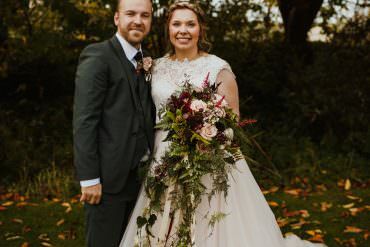 They looked gorgeous! 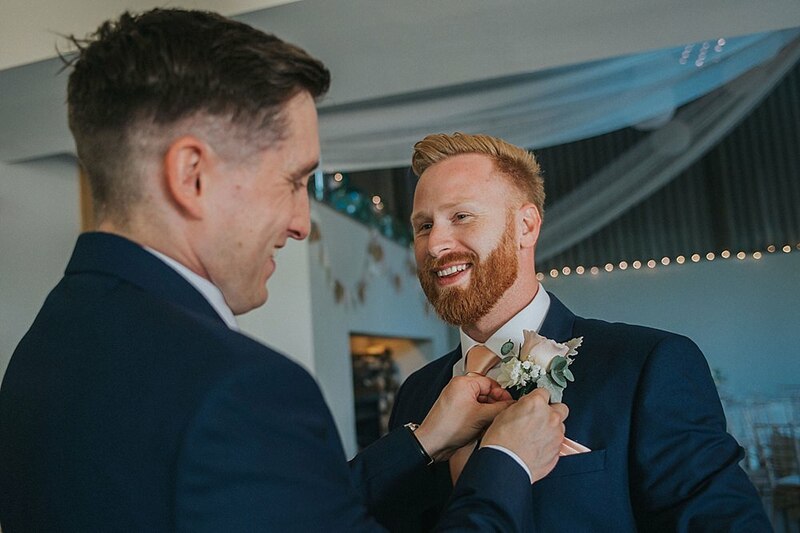 We picked Kieran’s dad, John, and our friend, Tony, to give readings during the ceremony. They both had free rein on the readings they wanted to choose, and both picked very different approaches so it was perfect. Kieran’s dad chose a short but beautiful poem to read, and Tony actually wrote his own reading which was really personal and funny. 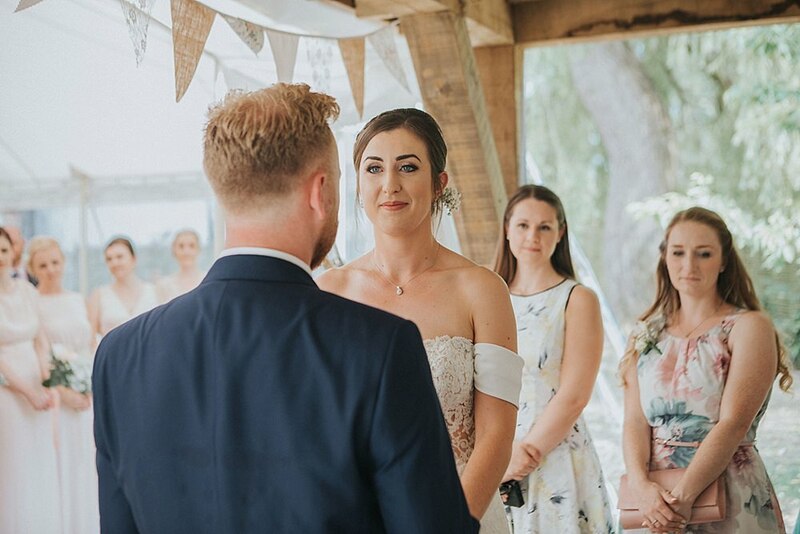 Tom Ryder, an acoustic singer and guitarist, played as our guests arrived at the venue, as I walked down the aisle, and during our drinks reception. 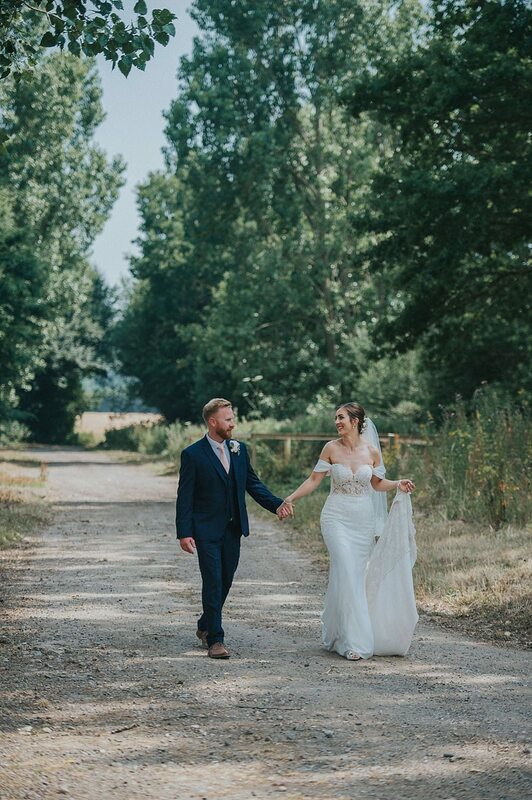 He sang ‘Tenerife Sea’ by Ed Sheeran as I walked down the aisle which is one of my favourite songs, and a moment I will never forget. His voice is amazing and all our guests commented on how great he was. Kieran was really keen on having a band in the evening, and once he found The Redfords we were sold. They were great at getting everyone in the party mood, did some great covers, and even had a box of props for people to dress up on the dancefloor. 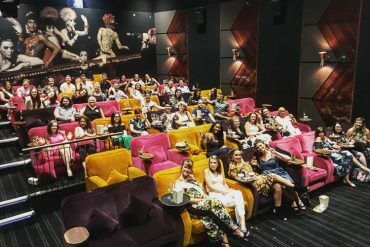 Their cover of ‘Three Lions (Football’s Coming Home)’ was perfectly timed during the World Cup frenzy and the buzz around the room was incredible! 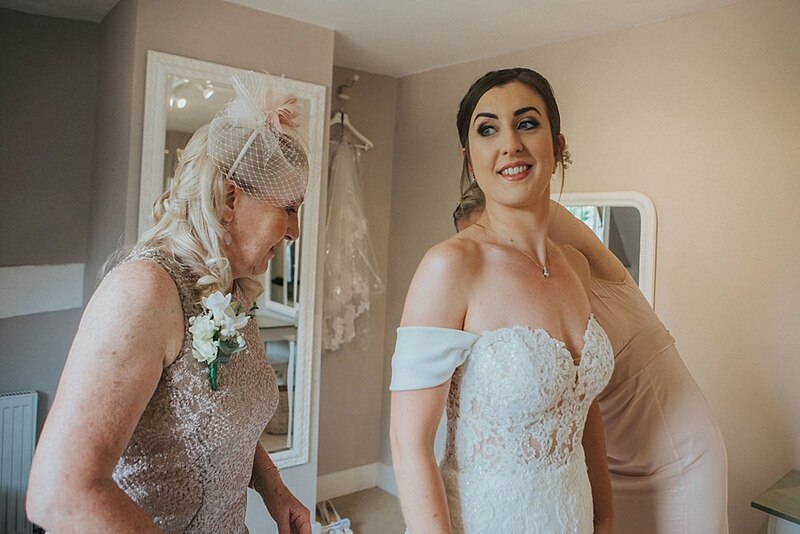 As soon as I started trying on wedding dresses I seemed drawn towards Pronovias designs. 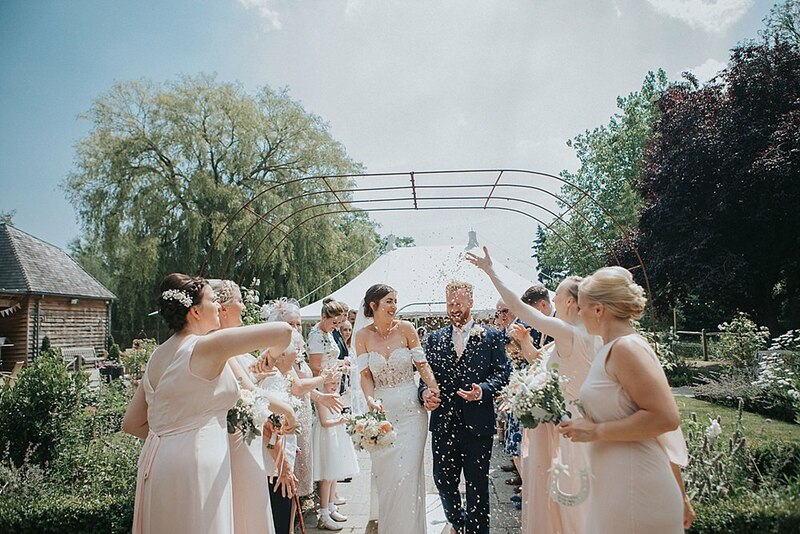 I loved the way their crepe dresses hung and the beautiful lace detail on their bodices. I ended up going to their flagship store in London and fell in love with their ‘Darcy’ dress. 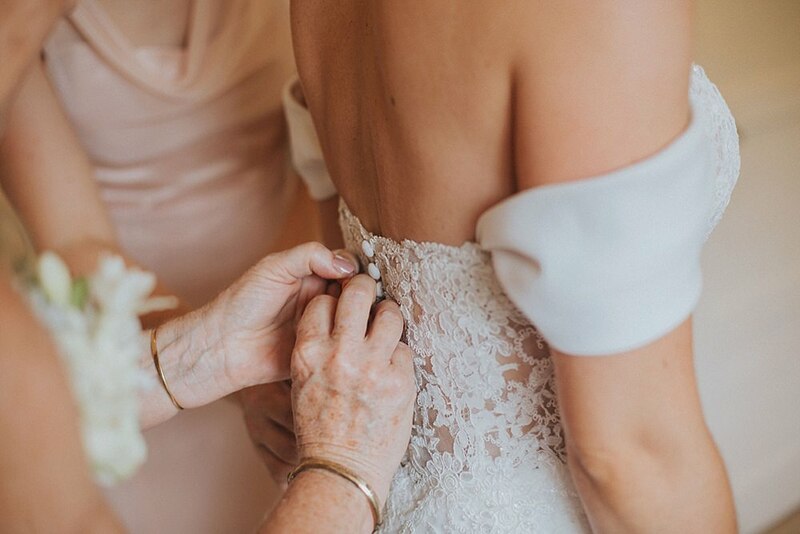 It had the most stunning back with buttons all the way down the train, which opened up with a lace insert. 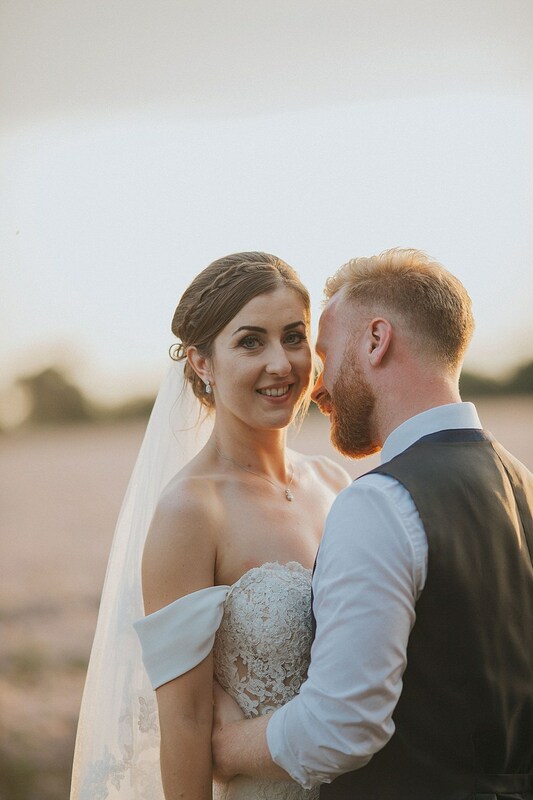 My veil was also from Pronovias, with the same lace detail at the edges. Picking it up and getting it home on the train was a memory I won’t forget! My shoes were peep toe ivory satin with a large bow on the front from Ted Baker. My necklace, bracelet and earrings were all teardrop shape bought for me by my Nan from Ivory & Co at John Lewis. 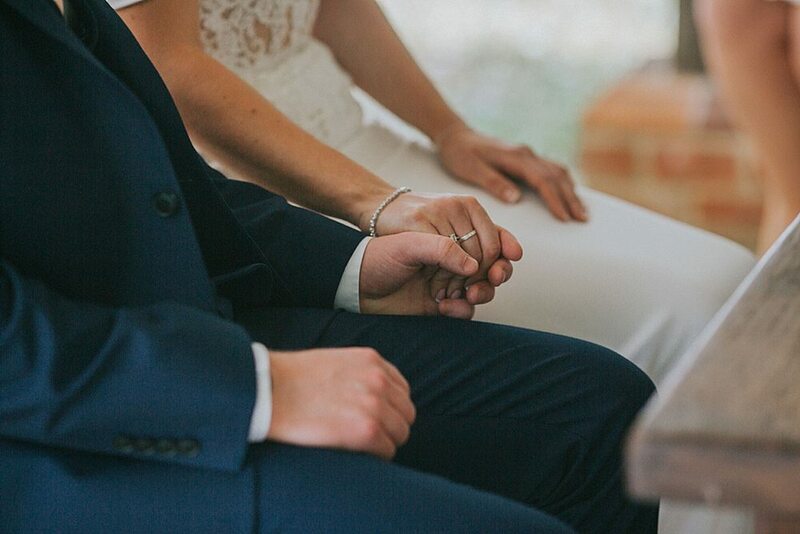 Kieran had also bought me a bracelet that the best man gave to me on the morning of the wedding, that had the words ‘Gramps loves you baby’ on it, which meant a lot as it is what my Grandpa would have said to me if he could have been there. 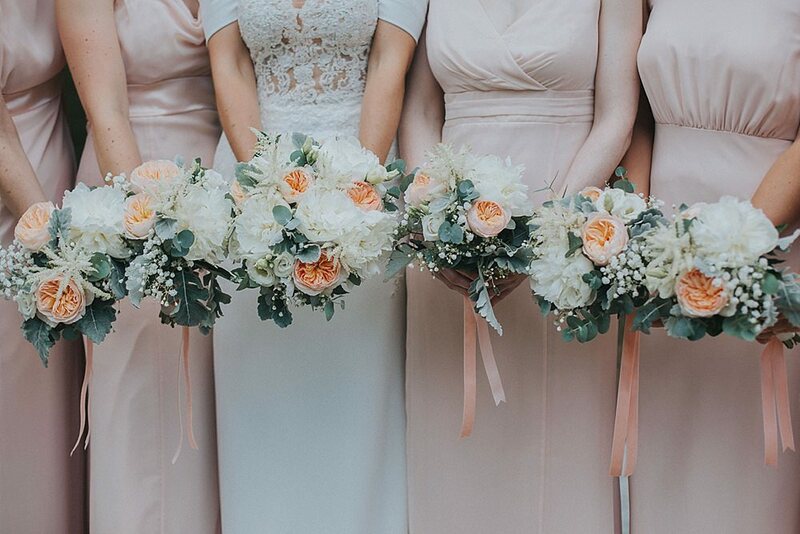 We wanted velvety textures and soft peaches for the flowers. 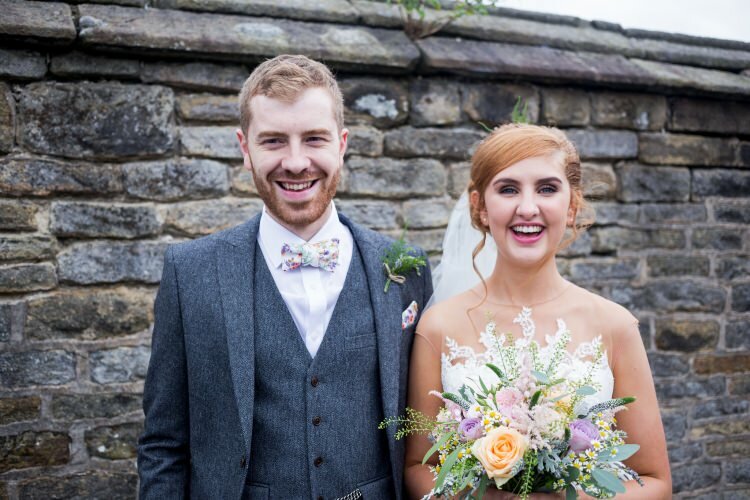 We used a local florist, Kirsty Lack, for the bouquets, buttonholes and table centres. Kirsty was really relaxed and seemed to get straight away what we were looking for. 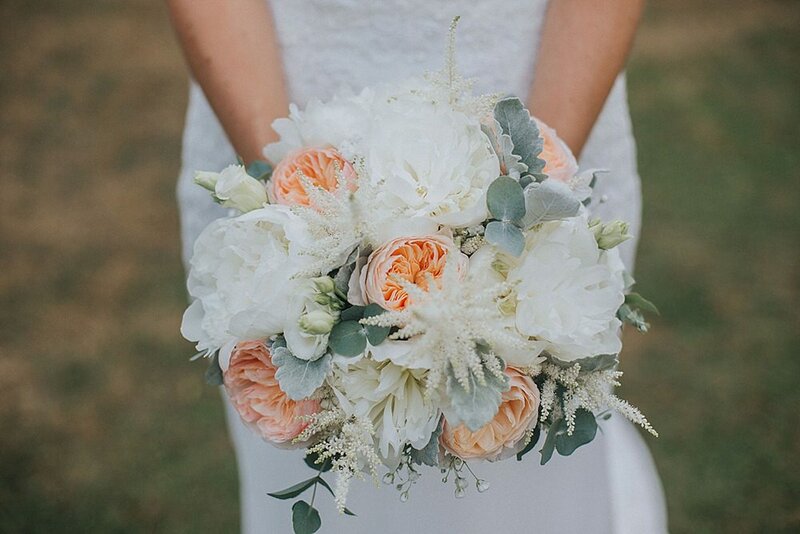 I loved my bouquet, and the colours all came together perfectly. 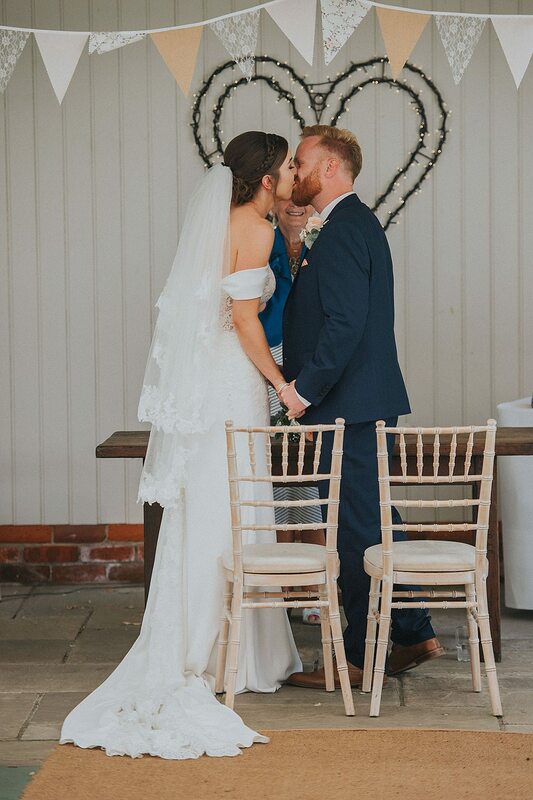 I had collected lots of vases, jars and pots, and spent the couple of days before the wedding raiding mine and my mum’s garden for flowers and plants that I could put together myself to help bring the outdoors inside the venue. 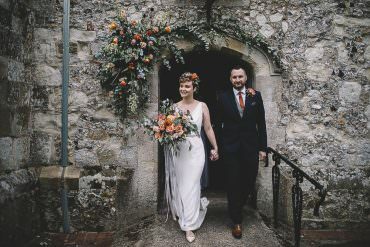 I created jars of flowers and wooden crates of colourful plants for inside the venue, and delicate hanging pots for shepherds’ crooks that I dotted along the aisle. As well as saving money, it was also really nice having flowers from our garden at home with us as a small personal touch. 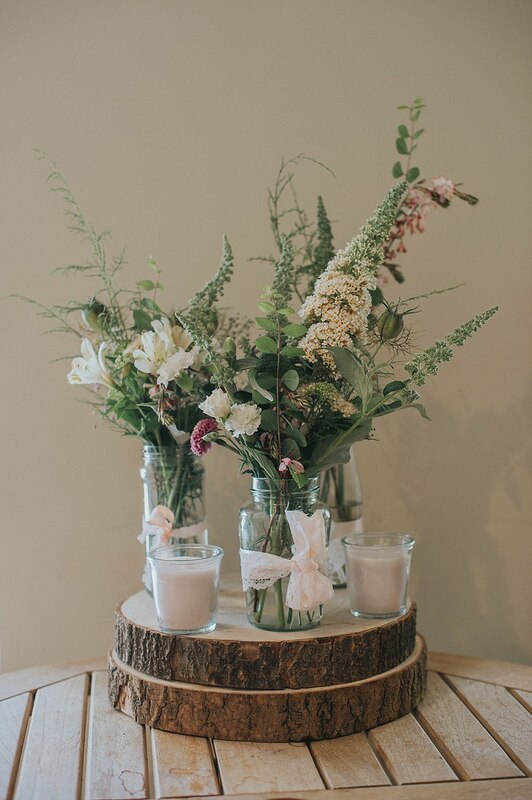 I decorated the jars with peach ribbon and hessian, and dotted them around the venue to bring everything together. Our very close friend Terri Howell made our wedding cake as our present. She had also made our surprise engagement cake too! The cake was 4 tiers of all different flavours, with a semi-naked buttercream around the outside. 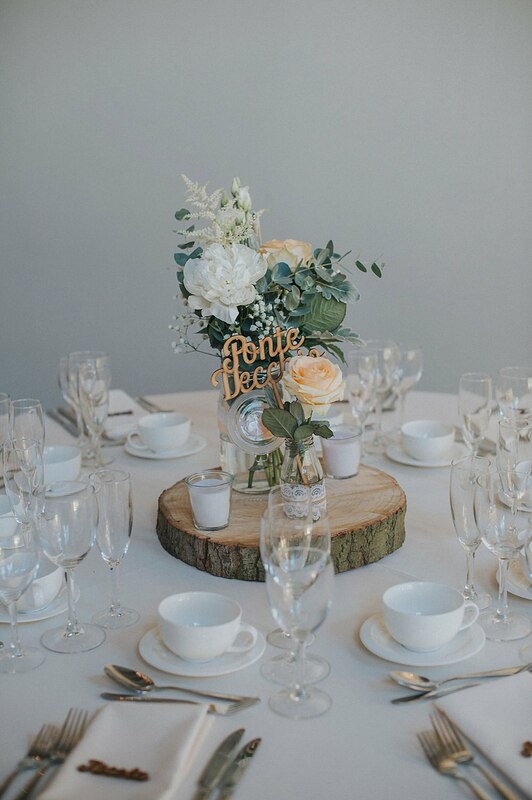 It was then decorated with beautiful peach flowers and foliage by the florist, and topped with a wooden cake topper. How Terri got the buttercream to stay put and the cake to stay upright in the heat I have no idea, but it was incredible and I was so pleased with how gorgeous it looked. 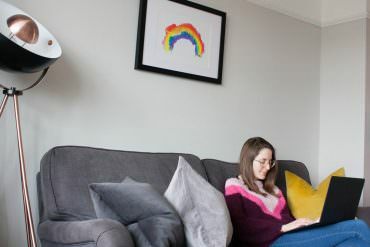 I did a lot of the décor myself, and really enjoyed having the opportunity to be creative. 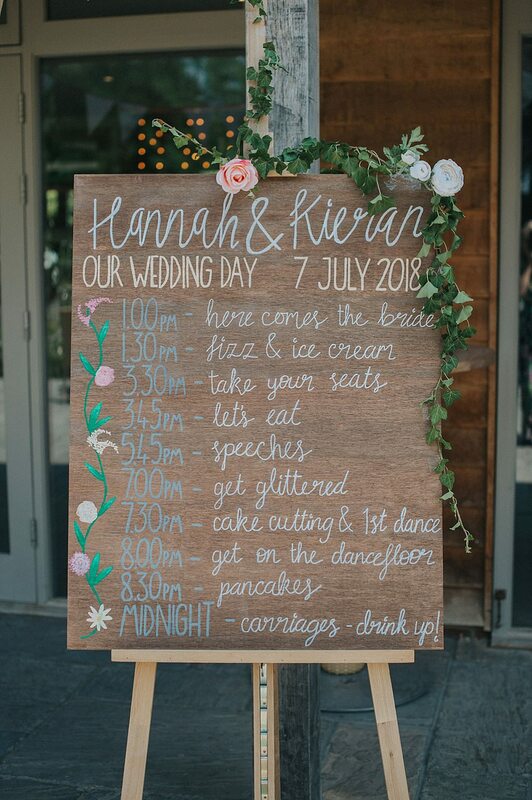 I particularly enjoyed making the wooden signs, table plan and order of the day. 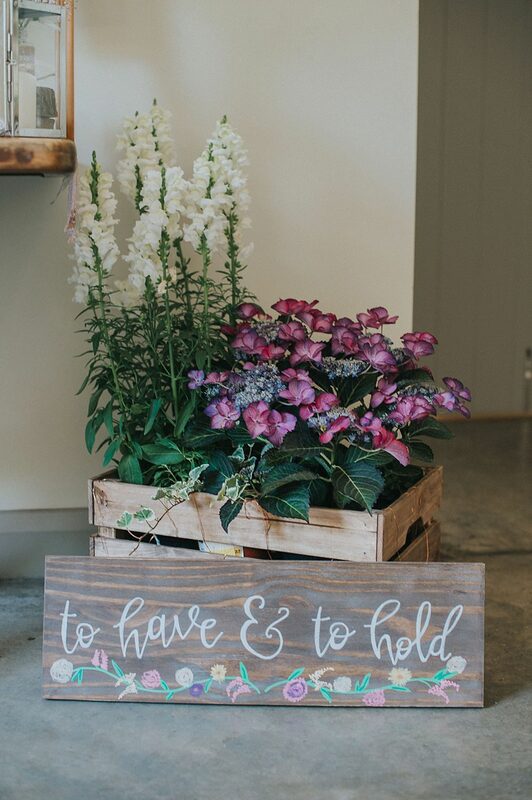 I used wood from a local timber yard, and bought paint pens to decorate with the wording we wanted to use and floral designs. 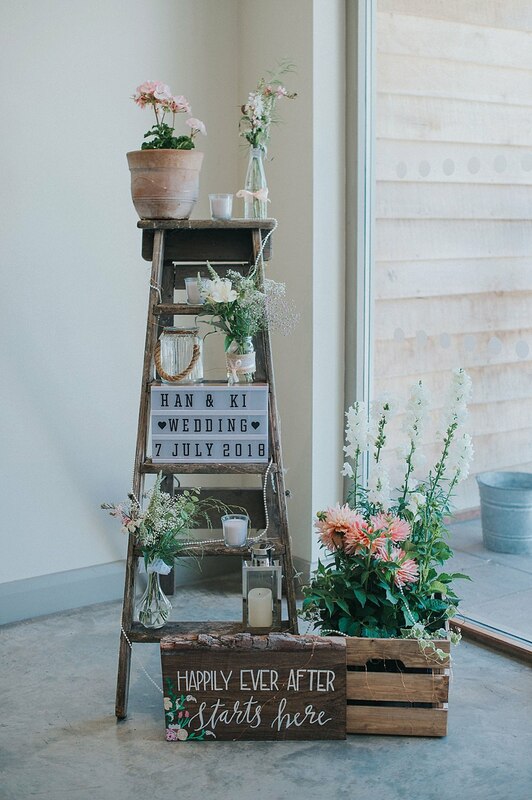 I also bought an old wooden ladder from eBay and decked it with candles, signs and flowers to place in the corner of the barn for a decorative touch. 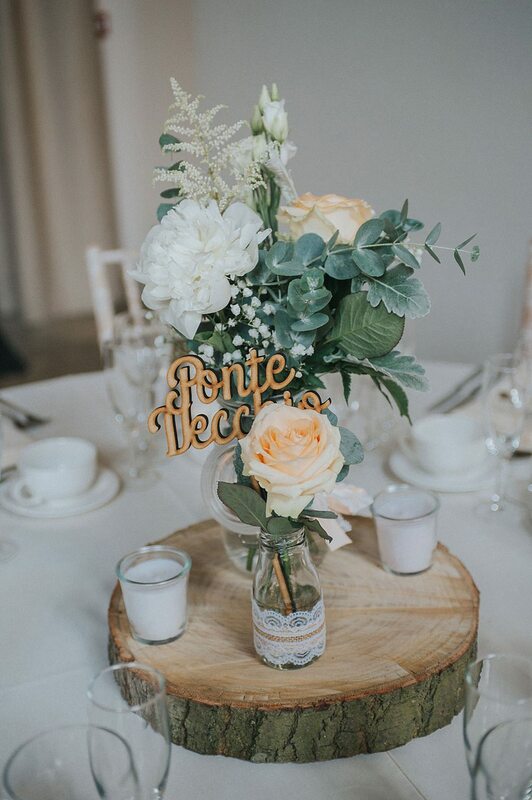 My sister managed to get me some large wooden log slices, so I used these to sit the wedding cake and the table centres on. 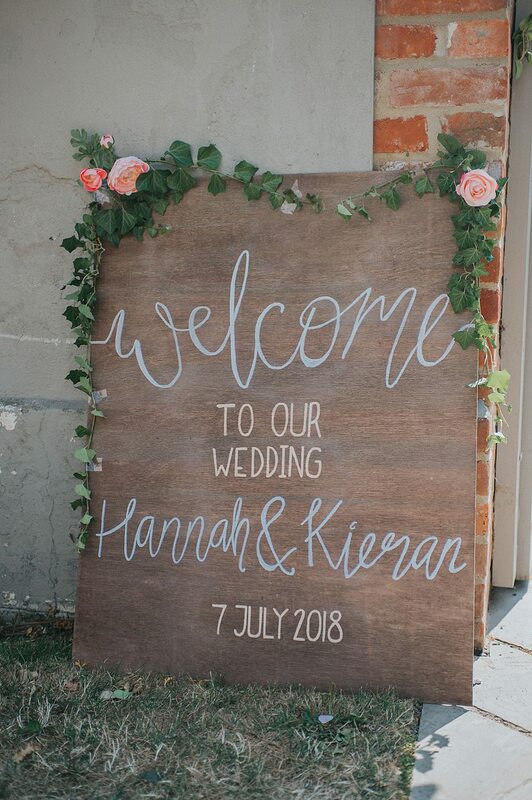 They were really rustic and chunky (despite the many hours that Kieran had spent sanding them down) and I loved the look that they gave to the decoration. 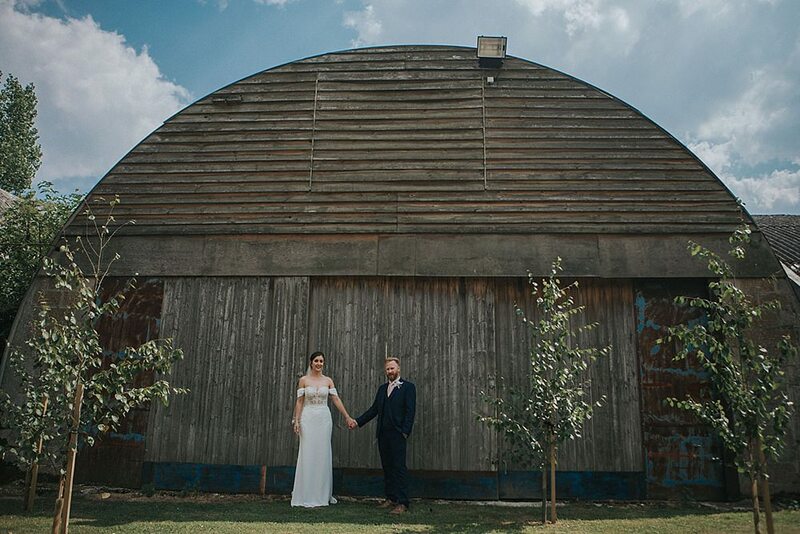 The barn was like a blank canvas and we could get in the day before the wedding in order to decorate. 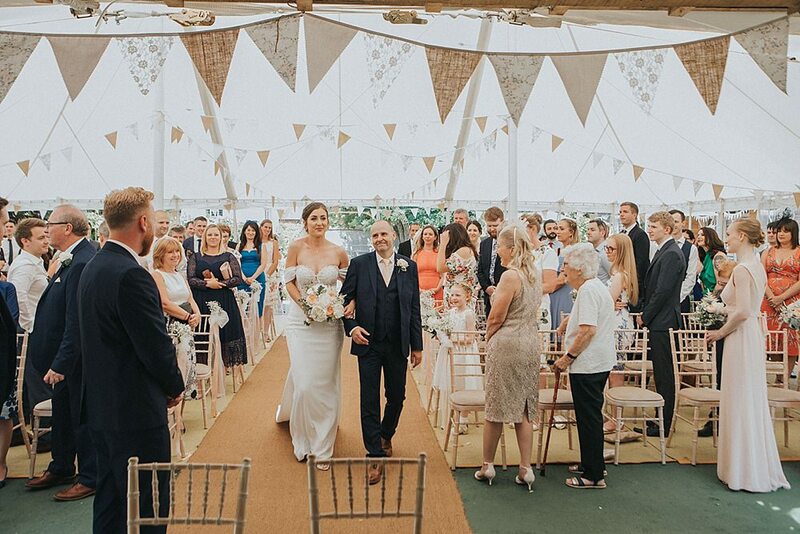 Armed with a team of wonderful friends, we managed to spend the day before the wedding turning the barn into the vision we had imagined – with more bunting than you could shake a stick at! 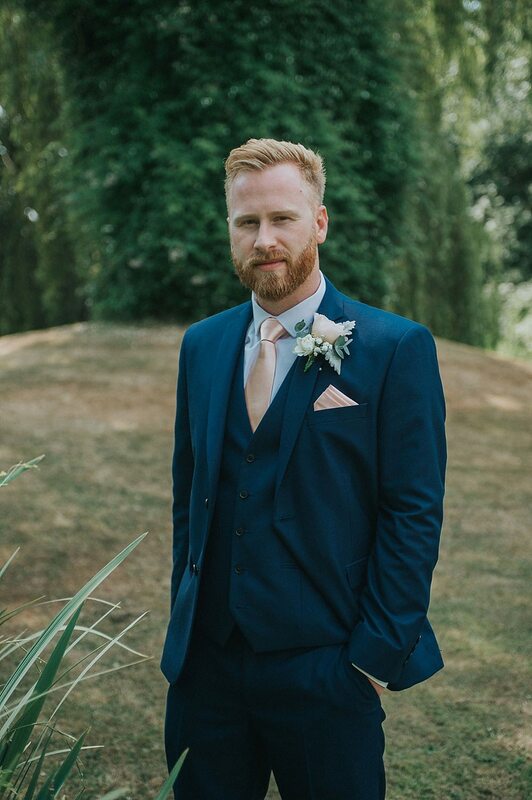 The staff at the venue were great at helping us set up, and I left the venue the night before the wedding feeling so excited for the next day! 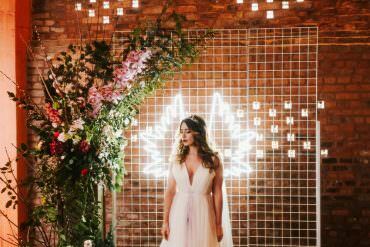 On the evening of the wedding, we had arranged for In Your Dreams to come along and decorate everyone with glitter and gems. 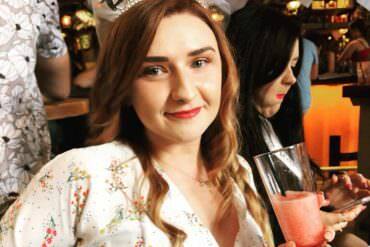 This really got everyone into the party spirit, and was a fun and quirky touch. 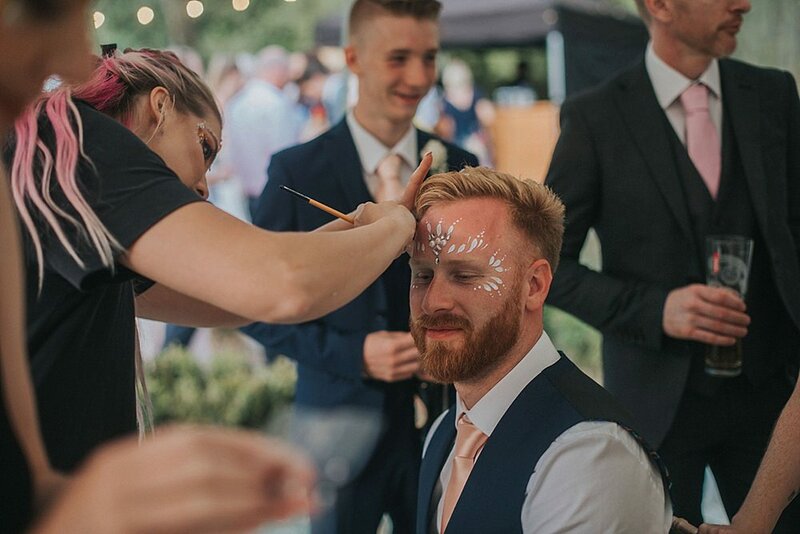 There are some great glitter photos, and even the men got involved! 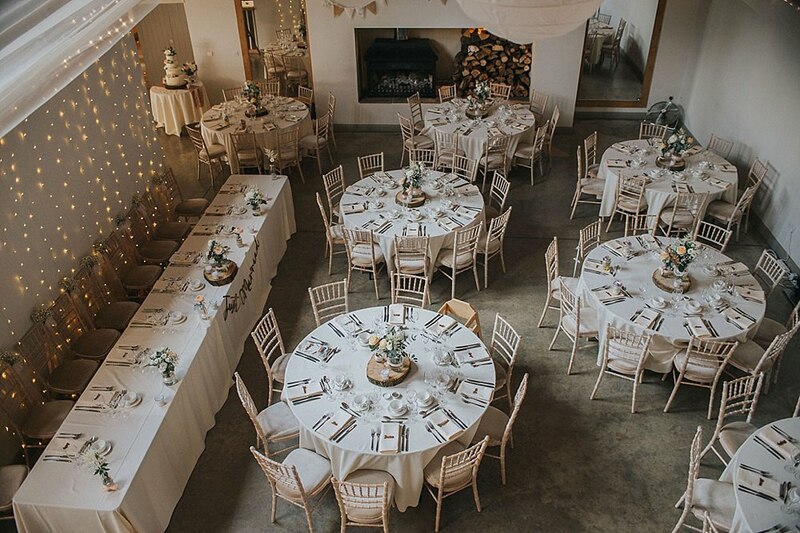 We used Limeberry Caterers for our canapes and wedding breakfast. They served the most delicious fish and chips in cones. We also had an ice cream bike from Rowleys Traditional Ice Cream, which was such a great idea in the 30 degree heat! Everyone tucked in for an ice cream following the ceremony, and it also made a great photo opportunity. In the evening we had pancakes served in a marquee by Three Stacks Pancakes. They were delicious American style fluffy pancakes, with a selection of yummy toppings for everyone to feast on in between dancing! As soon as we got engaged we knew which photographer we wanted. 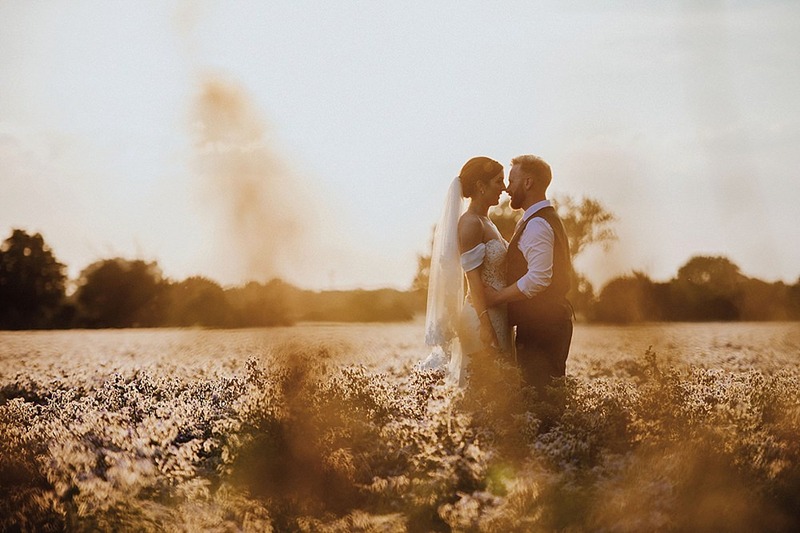 Julia & You had photographed a couple of our friends’ weddings, and I was so impressed with her work. 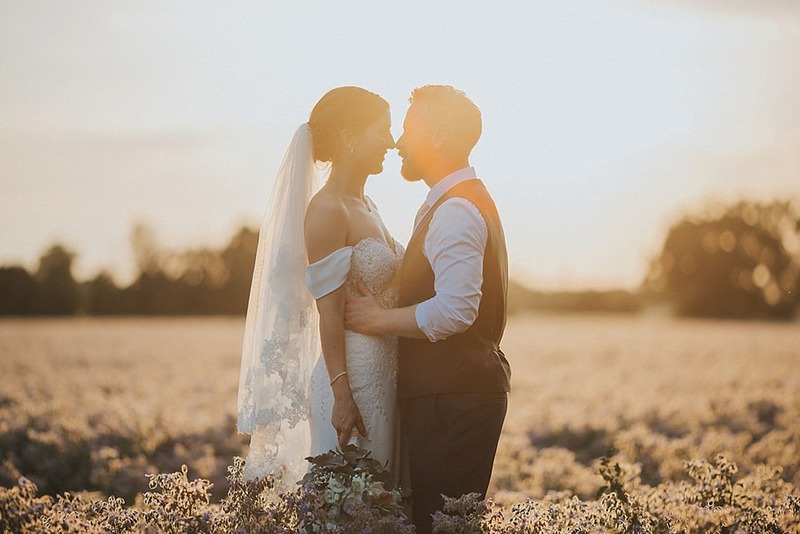 The photos all had a beautiful soft finish and Julia seemed to capture the light just right. 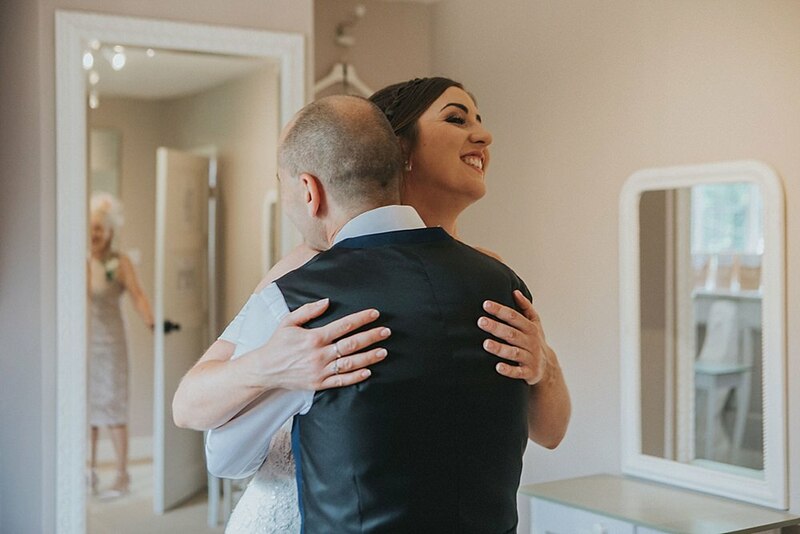 We actually worked our wedding date around Julia’s availability, and I am so glad we did! 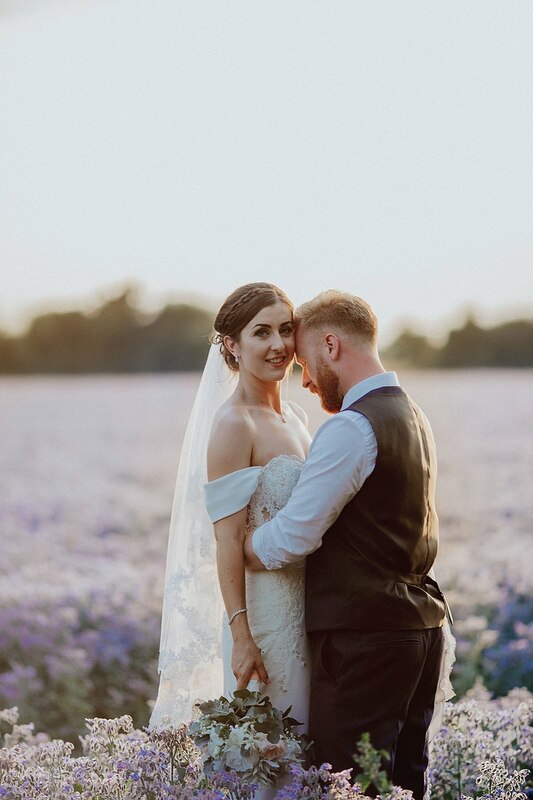 The photos are beautiful and we loved so many we just kept adding and adding to the album. 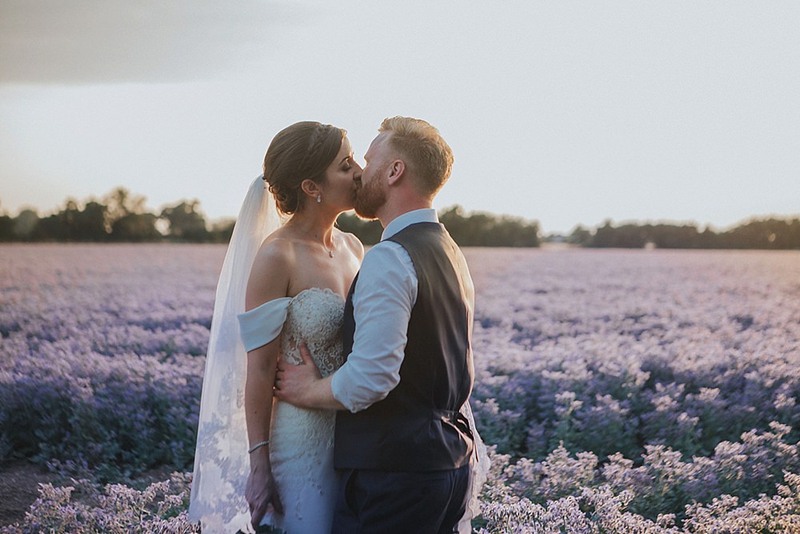 Julia and Michelle were so relaxed and accommodating on the day, and we have a lovely mix of the formal shots we wanted along with more natural photos with some amazing backdrops. A couple of days after the wedding we flew to California for a road trip. It didn’t get off to a good start when I forget to set the alarm for the right time and we were woken up by the taxi driver knocking on the door! But once we were in the air all was forgiven! We spent nearly 3 weeks driving round California, including San Francisco, Yosemite Park, the Big Sur, and Santa Monica. We finished it off in style in Las Vegas, and it was the most perfect break to start our married life together. 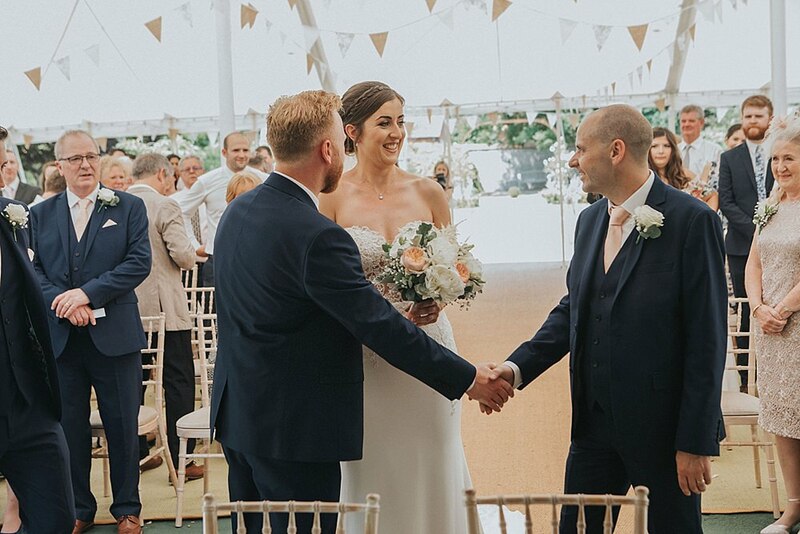 I will never forget walking down the aisle to Kieran. 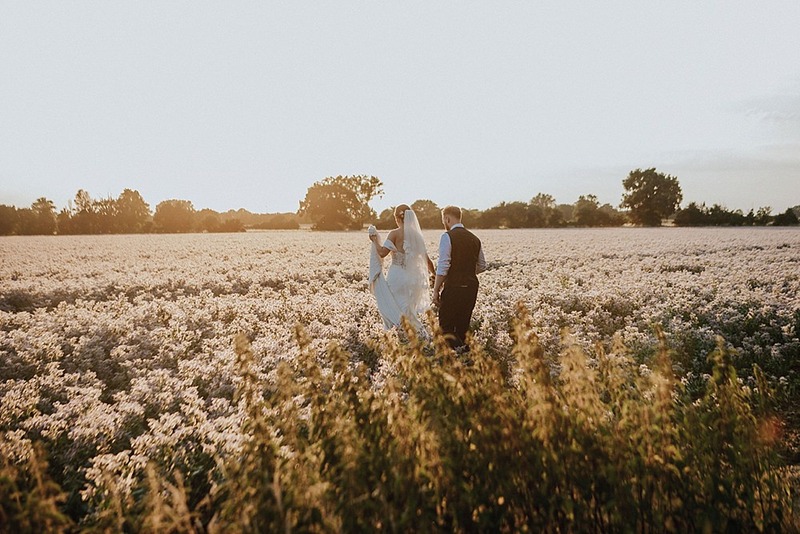 I think in the lead up to the wedding that is what I had been looking forward to the most. The venue has a really long aisle and each bridesmaid walked down first individually before me, so the build up was quite intense! 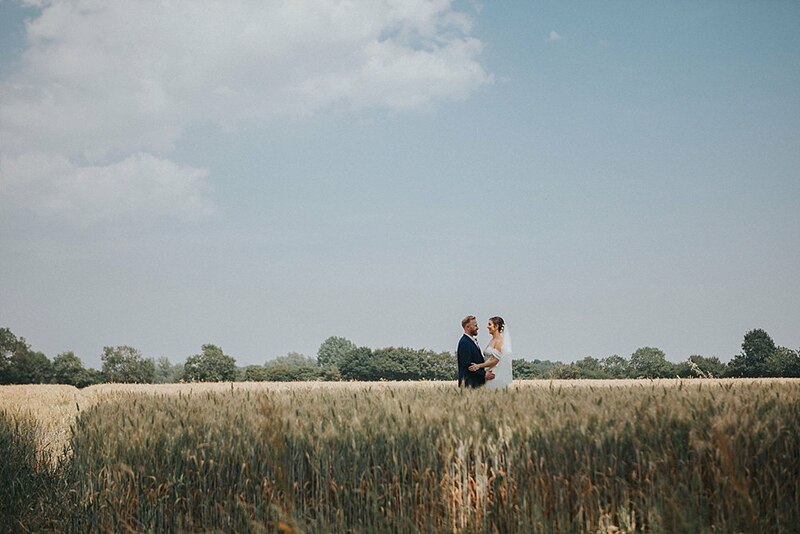 Our wedding day happened to be on the day that the England football team played Sweden in the World Cup. Luckily they won the game, so everyone was in good spirits. The band had a great idea of playing ‘‘Three Lions (Football’s Coming Home)’, which really got the crowd going and lots of shouts of ‘it’s coming home!’. At the end of the night, Kieran and I also had a glass of champagne with just the two of us in the wedding grounds once everyone had left. 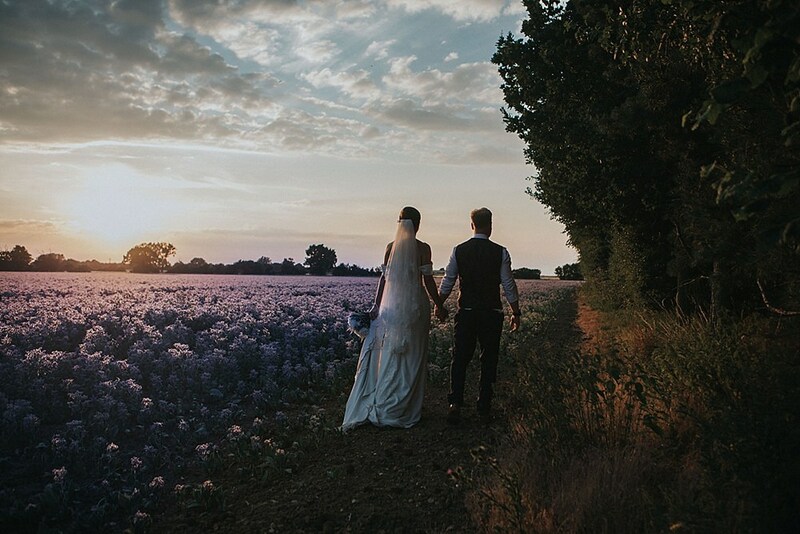 It was a lovely moment of reflection and something that we will both treasure after such a wonderful day. Try and enjoy every minute. You spend so much money and time planning the day, that it is easy to get caught up in the little details. Look around, look at all the people that have come to celebrate with you, and soak it all in! 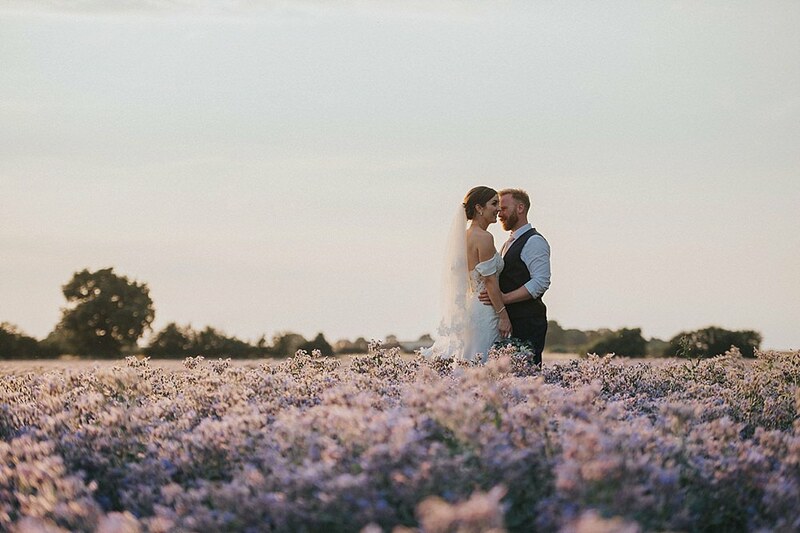 Never did I think that a farm with a field of colorful flowers was a perfect scenery for the wedding photo shoot. I enjoyed looking at your lovely pictures. They are all breathtaking and beautiful!